I have a thing for books. I love to read and have piles of paperbacks (and some hardcovers) stacked around. But I am not a "keeper." While many of the books may hold a dear place in my heart, I can't see just leaving them on shelves like trophies for the rest of my life. It would be one thing if I thought I might go back and re-read them, or even if I might reference them. But I know I won't, and I'd love for someone else to have the chance to read them, too. So what to do with all those good books? I often use PaperBookSwap.com. It is a cool concept, but I find I send more books than I receive. The idea is that you trade used books. If you mostly send books, you are essentially paying up to $3.00 to give your books away. I can do that for a small stack, but not for 3 boxes worth! So I took the 3 boxes to a used book store. I thought they would be so excited since lots of my titles were current bestsellers. Wrong! They were mostly interested in some the classics. Seems lots of people bring in the popular titles and they can only accept what they are needing at the time. I decided the next step might be to donate the books. I called my public library and found out that they do accept used books and where I could drop them off. The library generally will sell most of them at a huge used book sale. If they are given an important book or something they need, they will add it to their circulation. Mostly they raise lots of money selling the donated books. I was glad they accepted mine! But what happens with the books that aren't sold even at sales like this? Before they all head to the recycling center, some artists collect the used books for their material. 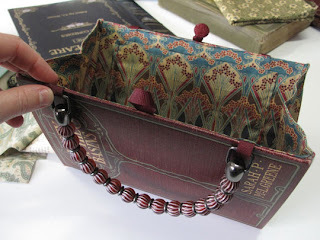 Take a look at this women who makes purses from used books. They are pretty amazing! Caitlin Phillips creates these beautiful book purses, which were recently featured on NPR. you are right to give the books away but I love seeing them on shelves. I look at them like "old friends" and they give me comfort, a smile or a just a memory of when I read it. I probably even have some of your old books:}! don't get me wrong - i still have shelves and shelves of books. i just had SO many that i had to keep them moving along, you know? i love books! You should check out bookcrossing.com. You register your book and then leave it for someone to find and read. They then record the book online and the cycle continues. The book can travel all around the world - or maybe just your town. Another fun aspect is that you can look on the website for recent book drops in your area and then go out and try to find a book that was 'released'. Hi. The recent 'anonymous' post was from '3 piping plovers'. I registered for a Google account after I sent you the bookcrossing.com information. Thanks. THANKS! I love the idea of bookcrossing.com. It is like yhe swap site I was using, but without the shipping. It also reminds me a little of a treasure hunt, and who doesn't love those?? I will give it a try for sure. I know you love books! You are like me (i've seen you cook book collection:}) I guess I feel guilty about keep ing so many. 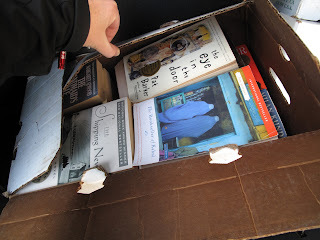 A while back I sent boxes of paperbacks to a women's prison. Because it was such a worthy cause, I didn't mind the one-time mailing cost. After my retirement, I cleaned out my professional library and found a local charity that sends books to a university in Sudan. There was no cost involved as they sent someone to get the boxes.